"Riley" is our first Chihuahua puppy born to our home. Like his father "Topo" he has that amazing outgoing temperment that people take notice of when he is out in public. While in Hawaii "Riley" became the #1 Smooth Coat Chihauhua in the state and was ranked 37th in the country for 2002. 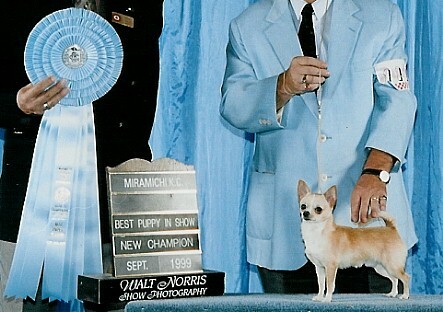 "Boots" at under a year of age placed Fifth in points for Smooth Coat Chihuahuas in Canada for 1999. Which included one Group 1st, five Group 2nd, five Group 3rd placements; As well as six BIS Puppy and 13 Group 1st Puppy placements. For his American CH he also finished in short order with multiple group placements. 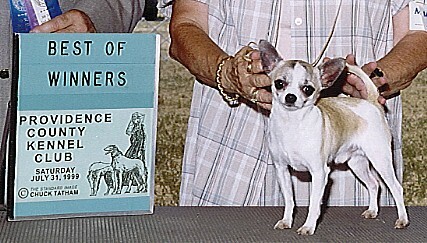 "Topper" Finished in six shows with three majors all at under a year of age. He was born August 19, 2001 and bred by Mary Ann Delano.